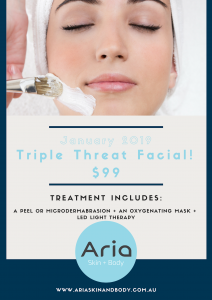 January is here – Try a Triple Threat Facial for $99! New Year is a time for new skin goals! Kick start your results with this Triple Threat Facial to get your skin refined and glowing. Start your treatment with an in clinic peel or microdermabrasion depending on your individual skin needs. This will lightly resurface the skin and increase circulation, prepping the skin for further treatment. Follow this with Societe’s Oxygenating Mask, a two-step, professional grade, in-clinic treatment that delivers a boost of oxygen to increase skin cell metabolism increasing skin brightness and clarity. Increased circulation increases the delivery of nutrients bringing radiance and fresh skin. Also containing Chamomilla Recutita (Matricaria) Flower Extract this treatment is fantastic for soothing skin irritations while Beta Glucan promotes healing through skin immune cell macrophage activation! This mask is also perfect for skin experiencing breakout or congestion due to its antibacterial properties. Finish the facial with LED light therapy to continue to work on your skin at a cellular level. Use light therapy to stimulate cells promoting cellular energy and faster healing for rejuvenated skin! The perfect treatment trio all in one facial!